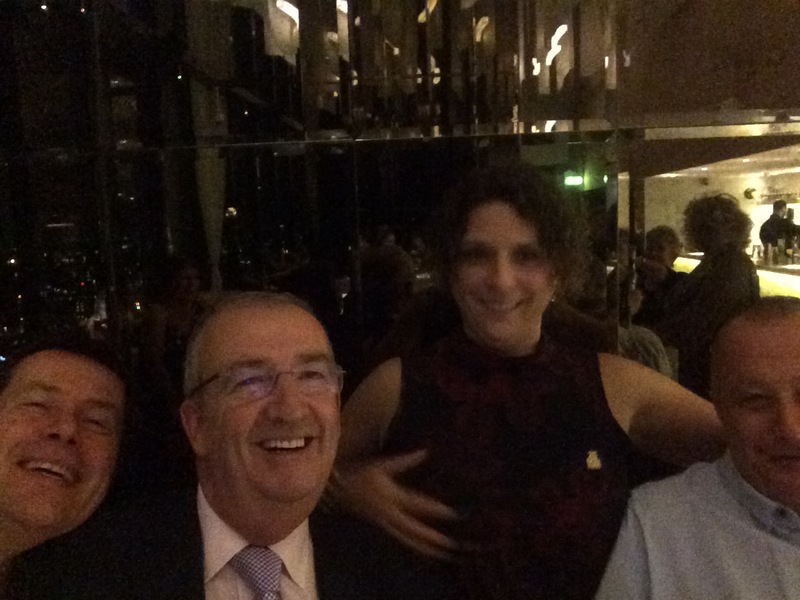 Last night saw us unite with Brian “Buzzer” Halcrow at The Duke of Albany in Washington as part of our plan to increase the pool offering for our customers. Buzzer is former world No.8 and UK No.3 in World Eight Ball Pool, he has used his extraordinary talent to travel the world and now he’s travelling the UK with us! 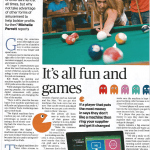 At Bob Rudd we’re keen to increase the emphasis placed on pool and gaming zones of pubs and bars, we see the value in bringing people together in a community venue and encouraging them to participate. The event last night was a great success and saw regulars from the pool team playing Buzzer alongside pool amateurs who were just up for a laugh. What would normally have been a quiet Tuesday night turned in to a fun filled evening’s entertainment. 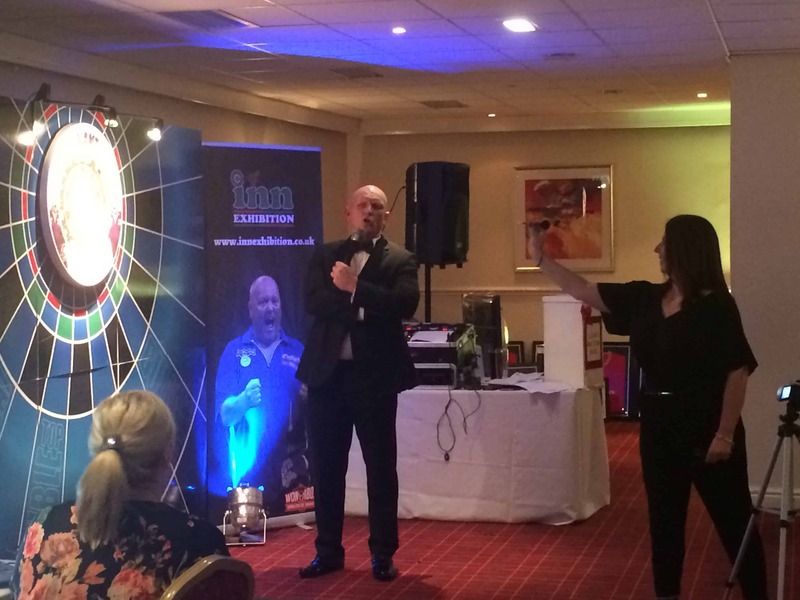 If you are interested in hiring Buzzer for the evening please just get in touch – helena.rudd@bobrudd.co.uk and we’ll set it up, you’re certainly in for a night to remember! 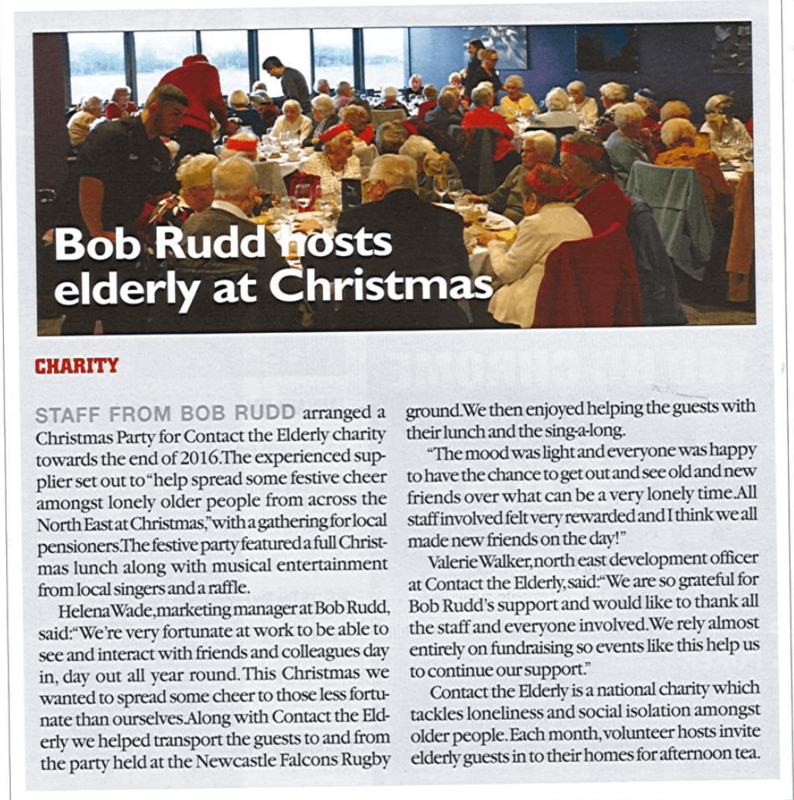 We had a great time working with the charity Contact the Elderly to reach out to lonely people in our area at Christmas. 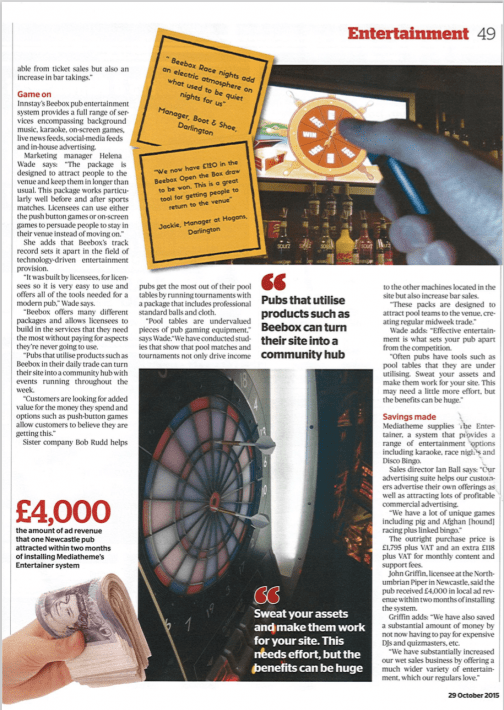 We’re featured in a fantastic article from The Morning Advertiser, all about how there is still a place for gaming and amusement equipment in British pubs. Click below to read the full piece. Our new line Bob’s Basics has now arrived! 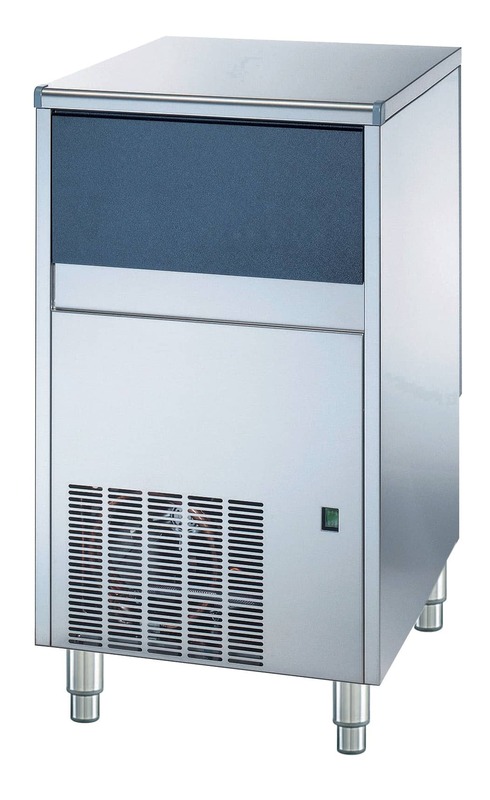 We’ve been asked by hundreds of customers over the years, do you supply ice makers? 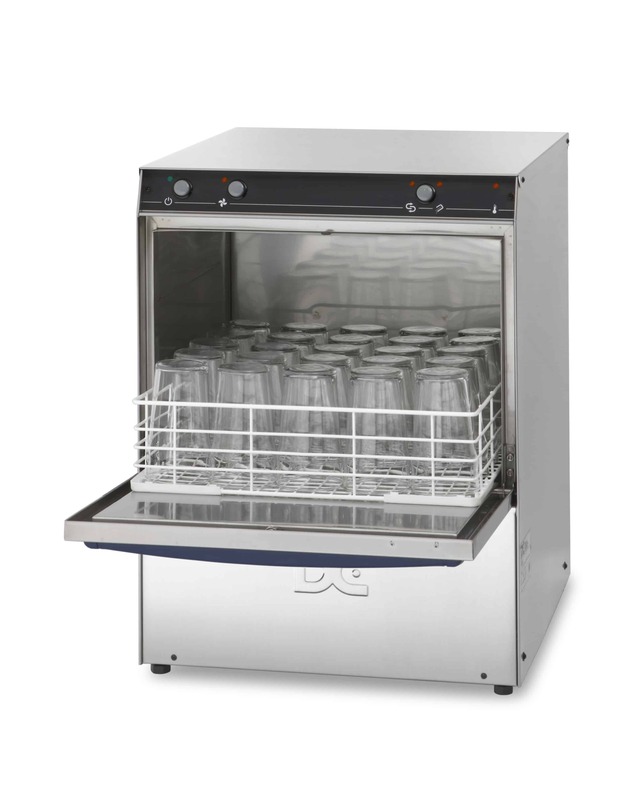 can you service my glass washer?…and now we can! Bob’s Basics is a new division of Bob Rudd Gaming & Amusement Machines focussed on providing the basics every bar needs. To launch we are focussing on the lease and rental of both glasswashers and icemakers. These will have a full service plan so you’ll never be stuck with a faulty machine again. Our products are brand new and come from one of the leading manufacturers in the UK. We offer a variety of glass washers to suit your pub’s needs, they are all; fast, economical, energy efficient and space saving. They have a fast 2 minute wash cycle for maximum efficiency and innovative wash pump to increase water pressure and improve results. All machines are very easy to use and have EasyClean filters, which means less effort from you or your staff. These top of the range ice makers provide classic cubes of crystalline ice that cools quickly and melts slowly. 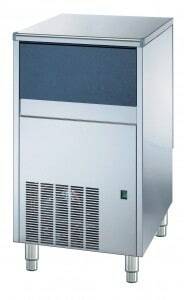 We can provide machines that operate from 20 up to 155 kg’s of ice per 24 hours. We offer each of these products on either a rental or a leased model, with a full service pack. Our website www.bobsbasics.co.uk will be up and running in the next week or so but in the meantime why not give John a call on 07740 401729 or email him john@bobrudd.co.uk to find out more info on these products. A Newcastle firm that supplies gaming machines throughout the entire UK has enjoyed a string of successes since has its founder’s son took over as managing director in May last year. 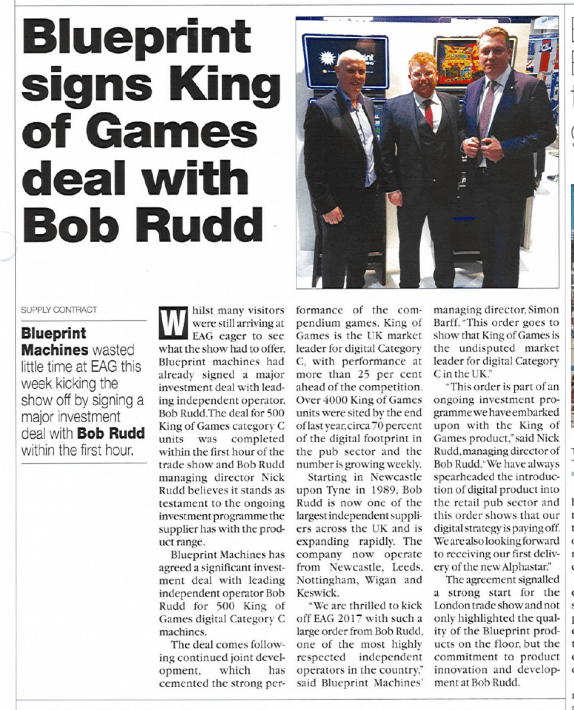 Nick Rudd, previously operations and marketing director at Bob Rudd Gaming & Amusement Machines, has completed a management buy-out of the company to become the main shareholder, after his father Bob stepped down from the top role to take up chairmanship of the business. 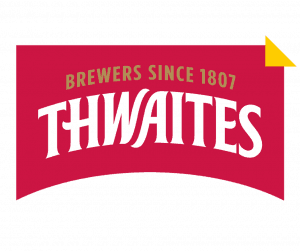 Soon after the changes were initiated, the firm won a contract to become the sole supplier for 30 Harnser Inns pubs, and another with the Archdiocese of Liverpool to supply social clubs with 200 items. * the sole supply of 35 Enjoy Pubs sites. 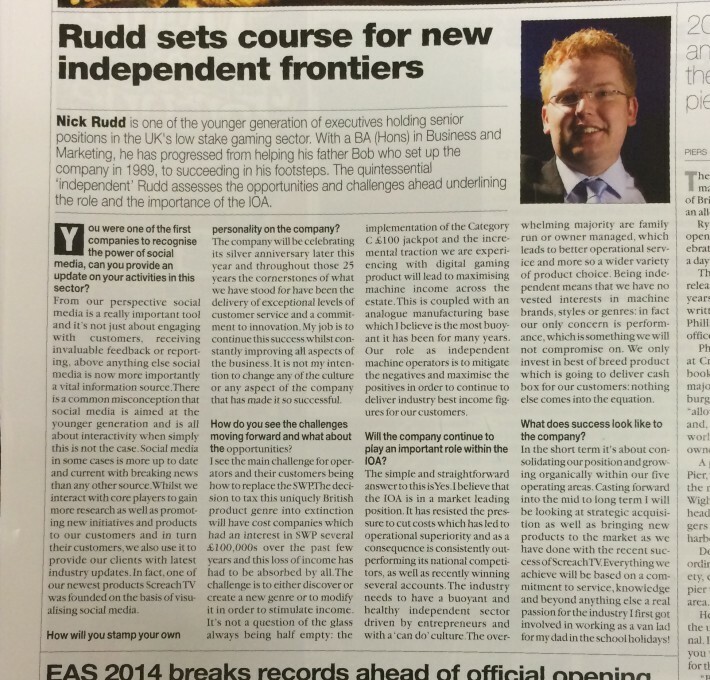 “It’s been a busy time – and challenging,” Nick Rudd said of his time at the top so far. “But being involved in all aspects of the business and being the ultimate decision maker has been interesting. The company, which was established in 1989 and supplies fruit machines, jukeboxes, quiz machines and pool tables, also increased its staff headcount slightly from 120 to 125. 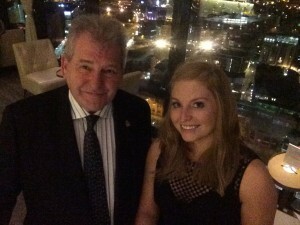 Among those to join was Charlotte Rudd, Mr Rudd’s sister, who has taken up the role of HR director, helping introduce a more “proactive” approach to that aspect of the business. The company, which has five UK locations, closed its Newark depot to relocate to Nottingham, giving its additional space and a larger, improved catchment area, with easier access to places such as Lancashire. Improved online presence and social media has also been a running theme, both within Bob Rudd itself and through its sister company Innstay, which was established two-and-a-half years ago. 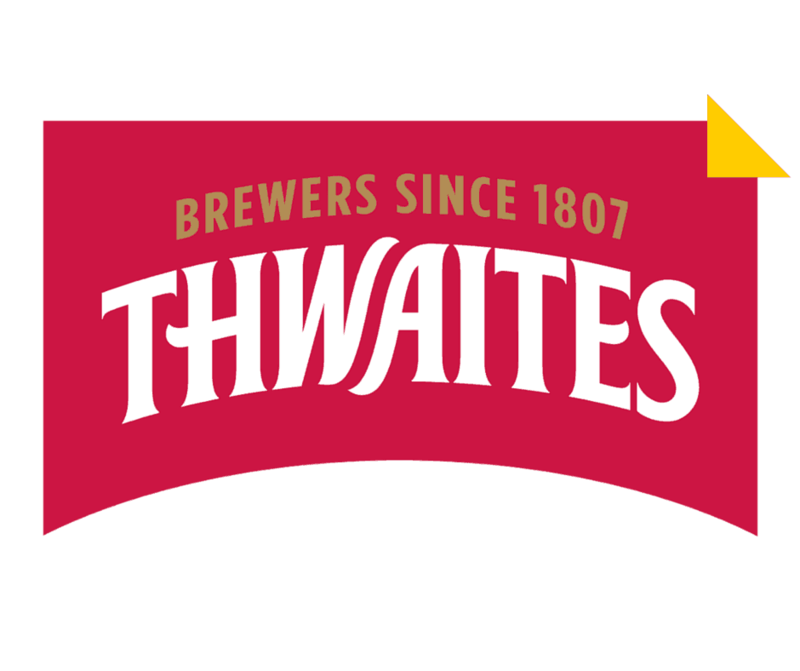 The latter’s product portfolio is based around attracting customers into pubs, keeping them there for longer periods and encouraging them to return. Among its offerings are pub entertainment systems, push button games, managed wifi solutions and a new social media management product. “Going forward, we’re looking at stability,” Mr Rudd said. “It’s been a busy work and we want to embed the results of that properly and make sure we’re operationally aligned. Have you ever thought of the importance of regular events and attractions in your venue? More often than not the quiz night and pool matches become part of the furniture and their importance takes a back seat. If you sit down and tally the positive impact these nights have on your bottom line you can often be astonished. For example we can look at pool matches. Quite often a venue will host a pool match once a week or once a fortnight, these pool matches attract a squad of players and an audience of circa 20 people for the home team and 12 for the away team. After some market research it is believed that the majority of customers who have come in for the pool match buy around 4-5 pints each. If we tally that up that is a weekly average of around 128 pints in one night! Just think of the boost for your pub on what would normally be a quiet night. 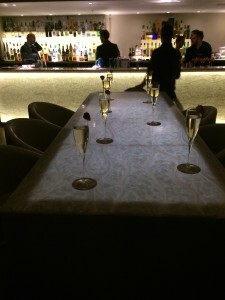 Lets look at how to start a successful regular event night in your venue. Make sure that all staff are onboard with the event, this is essential to ensure each night runs promptly and attracts customers back every week. 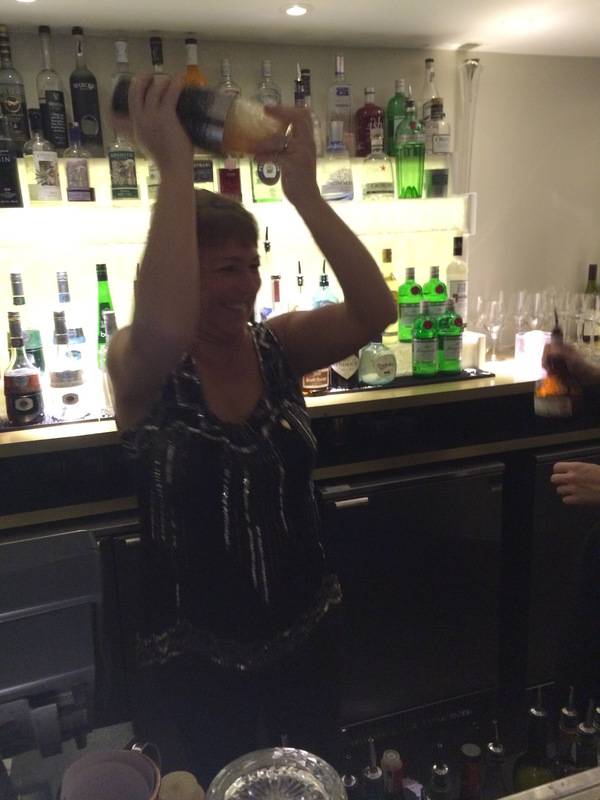 If your bar staff aren’t sure on the idea they won’t encourage customers to come a long, their backing is essential. This is split up into two types, in venue and out of venue. 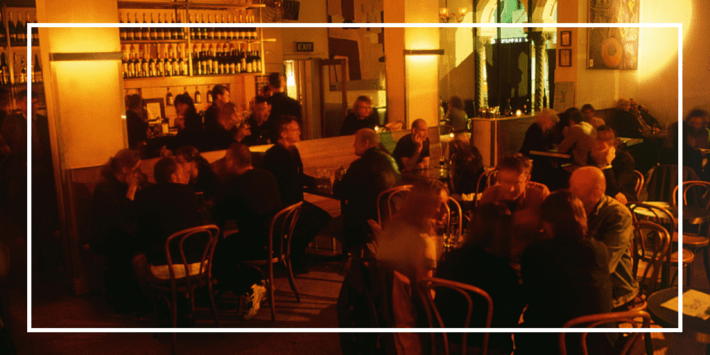 Word of mouth is the best form of promotion to customers already in your venue, tell everyone you serve a drink about it, or if you’re too busy why not get some flyers or business cards printed describing the event and give them to people with every round? You could also use advertising on your TV screens and posters to target those customers that do not go to the bar. To reach people outside of the venue, look to do both traditional and modern methods of marketing. 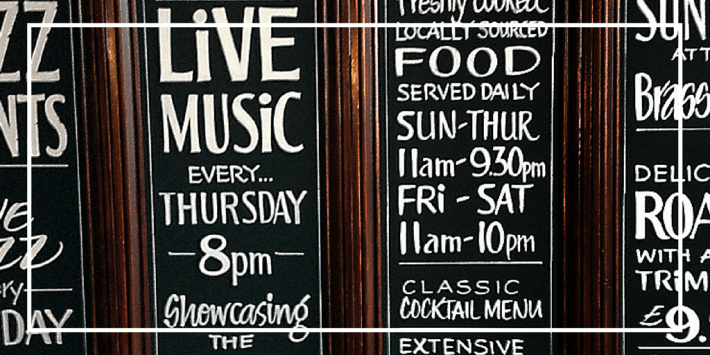 Ensure you have a banner or blackboard outside your venue with all of the event details on to catch the eye of anyone walking or driving past. Social media is also a very good tool to grab the attention of local people. Make sure you have social media accounts on Facebook and Twitter and keep them updated with how the event planning is going. You can also pay a small amount on these websites to boost your posts or create adverts to reach people who do not already follow you on social media. If you are lucky enough to have a database of customers emails then send them an e-shot telling them all about the new night. Remember to give an incentive to all customers coming for the first couple of weeks; this might be cheaper drinks or free snacks during the night. If you are short on time or resource to commit to marketing and running a weekly event there are many products now in the marketplace that can help! 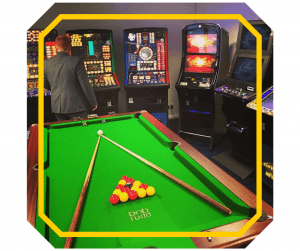 A variety of pub entertainment systems will allow on screen advertising and also on screen games such as bingo, key to the box and quizzes. These can all be set to auto play so minimum effort is required from your or your staff. For a small fee many companies will help you out with your social media, whether this is managing it from start to finish or getting it up and running for you to take over. Building a customer email database to market to can also be tiresome, why not install managed Wi-Fi in your pub? This does all of the hard work for you, any time someone logs onto your Wi-Fi you are given his or her name and email address. Use this to send them promotional news and offers. We have a sister company called Innstay who are experienced and qualified in supplying any of the products mentioned above, if you are interested in anything mentioned why not visit their website, just click below. This article was originally created by Bob Rudd for the FLVA Newsletter, we would like to thank the editor for including our piece in their publication. 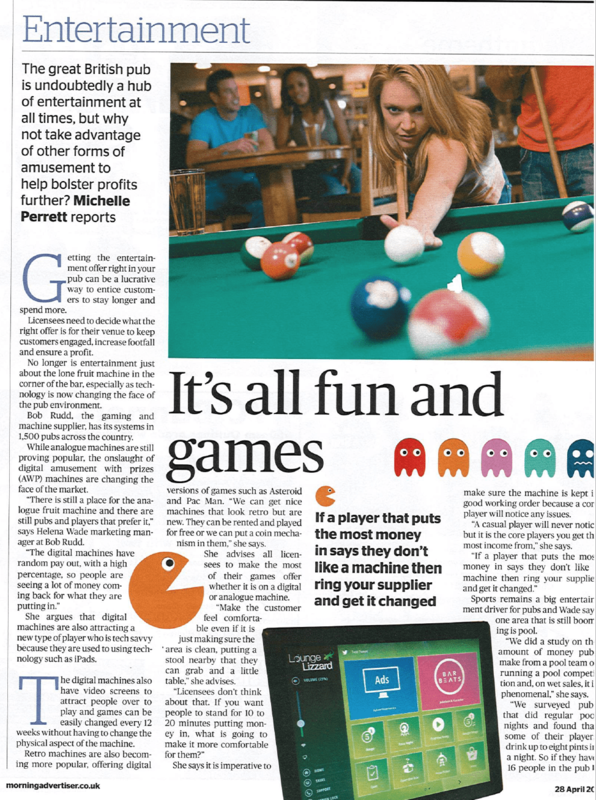 Have you thought about your choices if the Market Rent Option affects your Gaming Machines as well as your Beer? Towards the end of last year, MPs voted to include a market rent only option clause for tied tenants in the pubs code. This applies to any companies with over 500 pubs that include at least one tied/tenanted site. At the moment the act only legally applies to the beer tie within the pubs however we all know this may spread to affect other areas such as the gaming and amusement machine equipment. Do you have good quality machines in your pub? Your supplier should be investing in new machines for your site as the latest games are proven to make more cash in box. They should also be installing machines that have high approval rates, this means that the machine has been thoroughly tested in the market place and has received good takings in a variety of sites. Are you getting the best technical service? If your machine goes faulty you may be starting to lose money instantly, that’s why you need an excellent service response time. Its also important that the technicians who turn up on site are fully qualified with a high first time fix rate so they don’t need to visit again. Do you receive regular contact from your account manager? Account managers are invaluable at being able to ensure the machines sited are the most suitable ones for your site. They should also be informing you of any new products that might help boost your business. Have you been taught how to refill your machines? Refilling is the single greatest way of boosting the cash in box of your machines. Do it everyday! 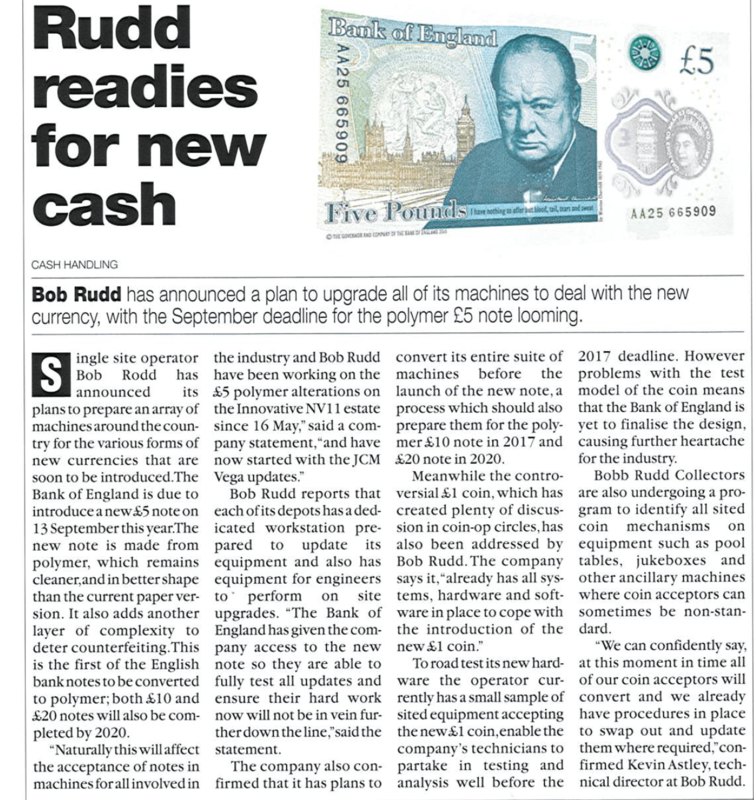 Here at Bob Rudd our collectors ensure that the hopper (pay out unit) is full at £350, this means the note acceptor is working and therefore core players know the machine is full, it can lead to an increase of 25% in your cash box! Are your collections frequent? It may seem irrelevant but having frequent collections is a great security measure. The more frequently your machine is emptied the less of a target it is for break-ins. The collectors are also often the first people to spot technical faults or security warnings. Finally, are all of your machines fitted with the highest anti fraud devices? Sadly we still see machines that are hit by complex frauds, if the machines are fitted with the right security software such as DES (Data Encryption Service) then this leaves a much smaller ability for them to be tampered with. Another key security features include operator specific fraud prevention; this is where the individual operator adds their own security features to further secure their own estate. It’s an exciting time in the pub industry and it is important that you know your options when the clause comes into place. 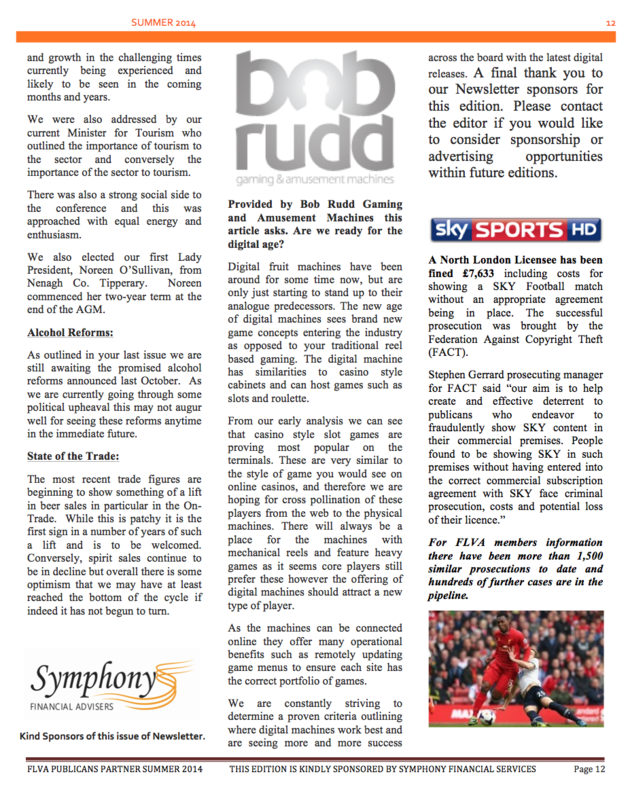 This article was our contribution to the January edition of the FLVA’s Publican’s Partner newsletter. You can find out more about the FLVA here. 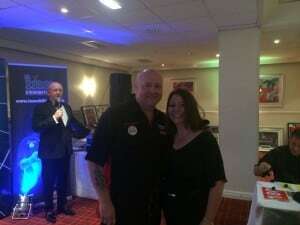 Last night the Bob Rudd gang attended the Andy Hamilton Charity Darts Exhibition at the Mecure Hotel in Bolton. It was an interactive experience for Denise as she got to try her hand at darts against Andy himself! Her prize moment came when she got a 180 against the star…..although rumour has it MC Paul Booth had a helping hand in that! Everyone thoroughly enjoyed themselves all for a good cause. We’re already looking forward to the next one! 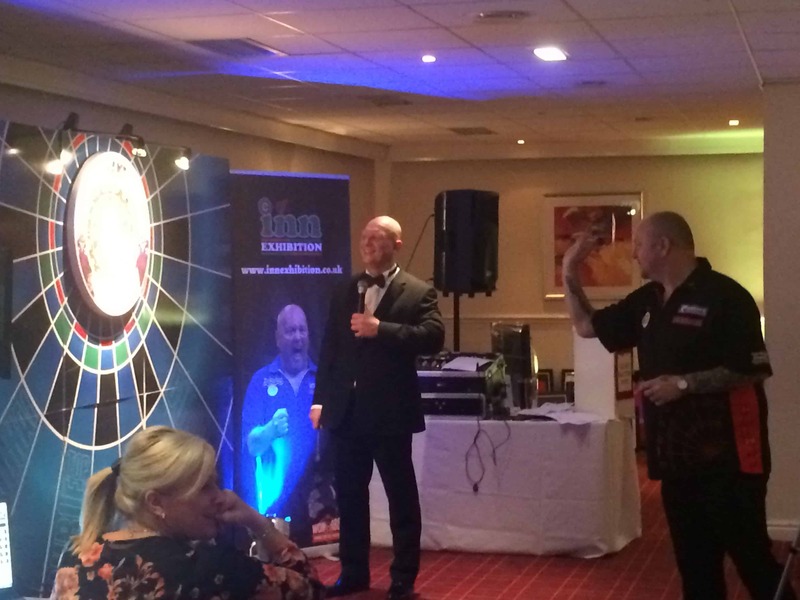 For more info on Andy’s Charity Darts Nights CLICK HERE. It’s our 25th year, so we decided to celebrate in style, cocktails, canapés and a wild night at Cloud 23. 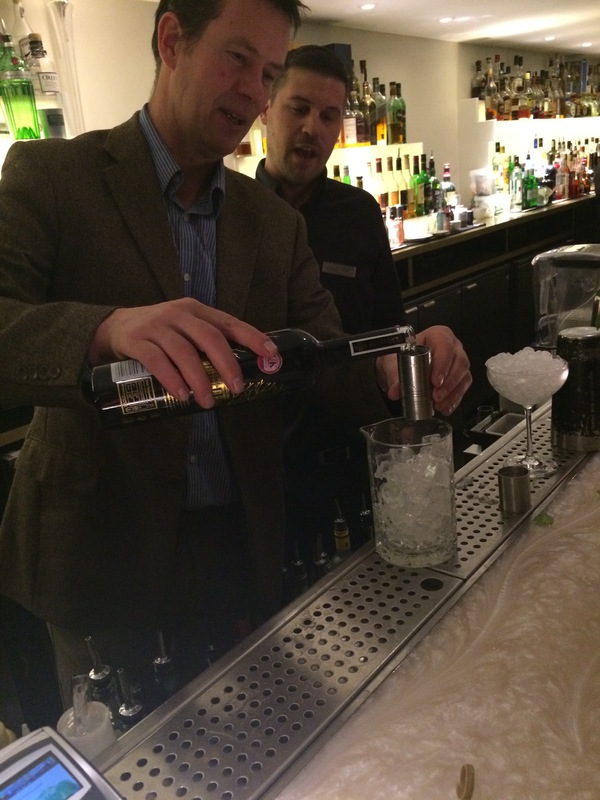 Keep reading to learn all about the order of events as we delved into the world of our customers….behind the bar! 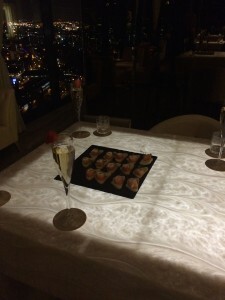 It was a wet and windy evening however the bright lights of the Hilton Cloud 23 bar were twinkling above us as we stepped into a night of luxury and fun. After riding the elevator up to the 23rd floor of the infamous Beetham Tower in Manchester we stepped out into the glamorous surroundings of the marble and mirrored bar. 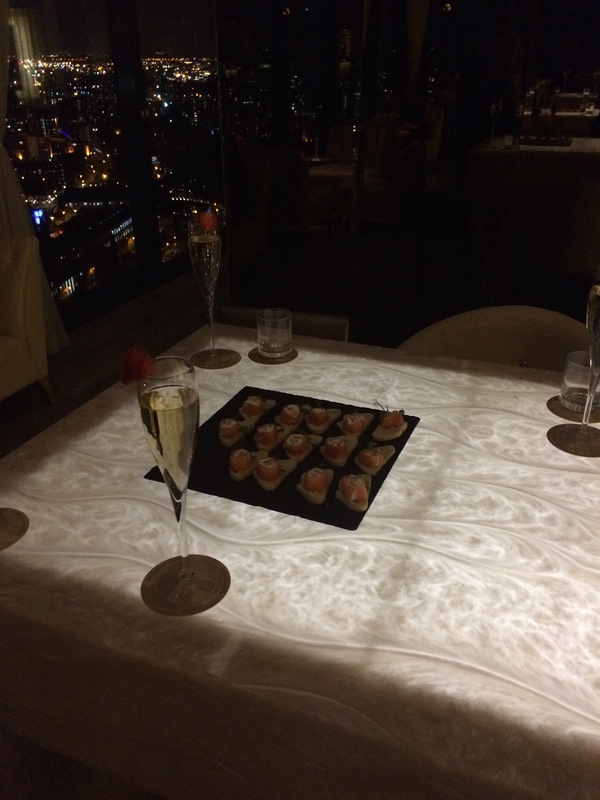 Champagne and Strawberries were ready to greet us as we took in the 180 degree view of Manchester City Centre. As guests begun to arrive our favourite gadget of the moment the “Selfie Stick” was out in full force capturing exciting moments. It soon became time to move onto the Cocktail Making Masterclass, the first group stepped up to learn the art of making the classic Italian Bellini. Peach and strawberry flavours were both on offer! 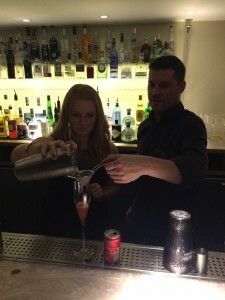 Next up was our chance to get behind the bar and make whatever we desired! There were Mojitos, Tequila Sunrises, Kir Royales, Martinis and Long Island Ice Teas. The most aggressive cocktail shaker award had to go to Heidi, whilst James’ whisking was second to none. 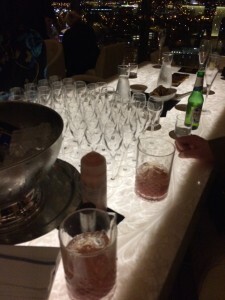 The crux of the night came when each group had to invent their own cocktail which was then judged by the Hilton’s expert mixologists. The winner ended up being a very strong dark rum and orange concoction named the “Ruddy”! 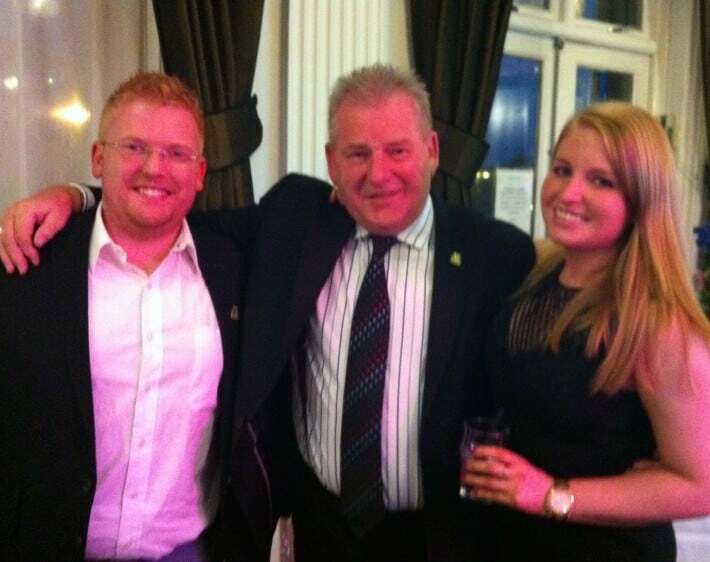 Overall we all had a fantastic night and want to say a big thank you to those who came and enjoyed it with us. Read our latest article on the 25th anniversary celebrations happening this year! 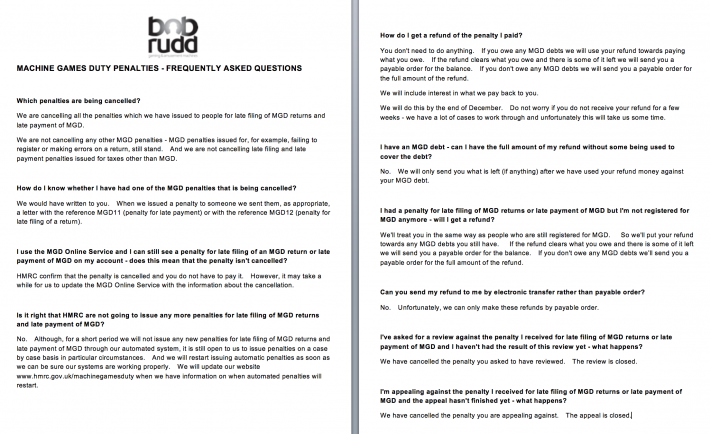 NEWS FLASH: Did you receive a penalty for late MGD filing or payment? 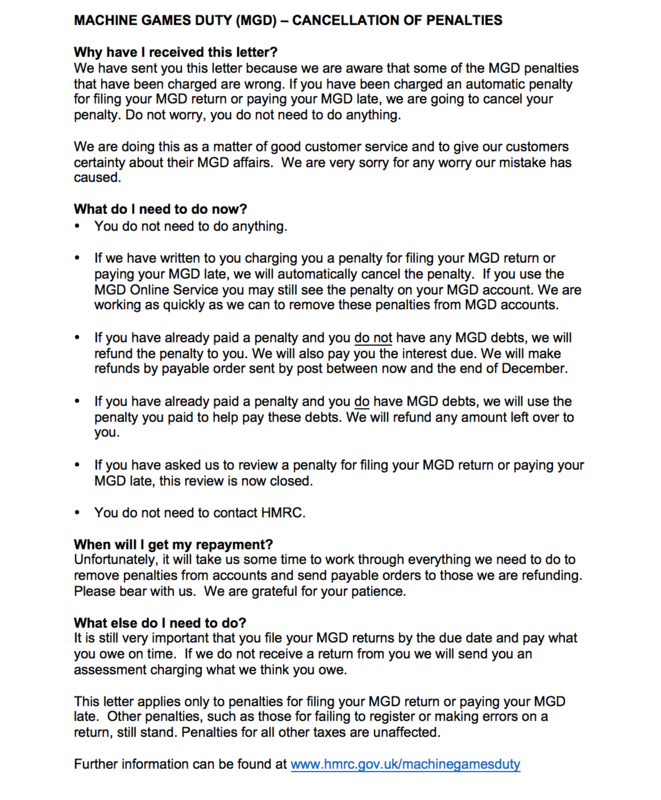 If you received a fine for late MGD filing or payment have a glance at the letter below. This outlines that these penalties should be getting reimbursed to yourselves as a gesture of good will. See our second article below for FAQs. Feeling sightly confused about MGD reimbursements? Have a glance at some of the frequently asked questions below! Are We Ready for the Digital Age? Read our recent article on digital fruit machines from the latest FLVA newsletter. Read below to find out all about how our MD Nick Rudd plans to take the company forward. Social Media is a fairly scary area for most managers, so why not take a look at our basic steps and see how utilising social media can help your business. 1. 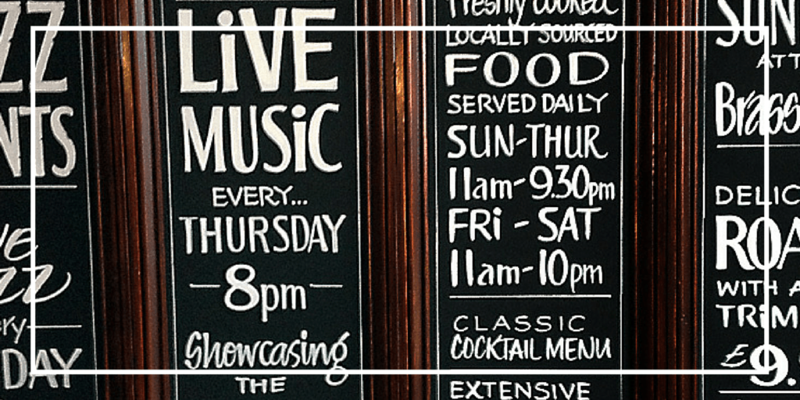 Be Nosy – Have a look at what other venues around you are doing on social media. Make sure you follow them and keep on top of their weekly events, it’s pointless both of you having quizzes on the same night! Also, see what seems to be popular on their Facebook page, has their picture of the Sunday Roast got 50 likes? Maybe you should start serving up roasts too? 2. Don’t Boast….Start a Conversation – Social Media is full of businesses boasting about their new products and offers, customers turn off when they see this. Instead engage with your followers and start conversations with them, this builds customer loyalty and loyalty builds sales. 3. Photo Opportunity – Tweets and posts with pictures get 2x the amount of engagement as those which are just plain text. Your venue, food, drinks and customers are all great, get snap happy with all of them! 4. Be Quick Off the Mark – If a customer engages with you on social media then jump on it and respond as quickly as you can. This shows you are approachable and that you care about your customers query. 5. 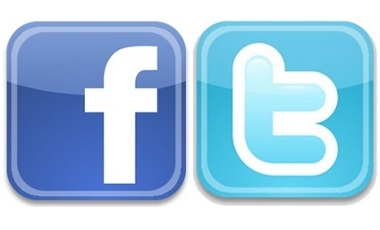 Social Media = Special Offers – Advertise special offers purely for your social media followers. This increases online engagement and builds a loyal customer base. This will boost your number of followers and therefore create a larger audience to advertise to….for free! 6. Find Friends – Build up alliances with small businesses in your area that do not compete with yours. Promote them on your site and they will do the same for you…..congrats your promotional message is now going to a whole new target audience. 7. Stay Local – Your venue is the hub of the community, this can be transferred to your online profiles too. Why not offer to advertise local events and create a buzz about your social profiles? Remember….Social media is not for direct selling, it is used to promote events and offers but more importantly to gain customer loyalty.